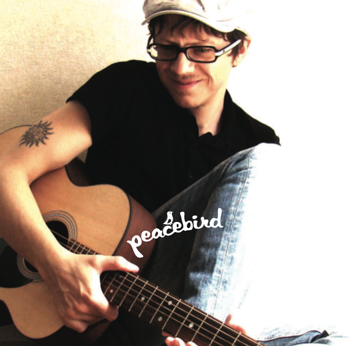 My live performance on Saturday in Koenji at the Boy Meets Girl event, will be built around the songs from the coming Peacebird album, as a kind of preview live performance. I will perform two sets, in Japan often called "two stage". Next weekend's Live gig at Mitsubishi Motors Show Room, also in Tokyo, will be more build around bossa-nova songs from my earlier albums, and a few covers. 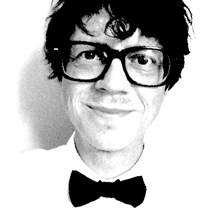 I also do a TANABATA gig, July 7th, at Tsuki Miru Kimi Omou in Aoyama! And I will participate in a charity live gig at TOTOSK in Nerima-ku, close to Heiwadai Station. This will also be a special event, where I share the "spotlight" with singer SAK. I will play guitar in her songs, and we will sing something together, so it will not be one of my usual live gigs. A part of the money goes to Tohoku charity. Couldn't think of a better subject, sorry! I'm looking forward to the completion and wish Kazuma and Maya all success with their debut album. Stockholm based singer NINA RIPE is also in the process of finishing her first album, with Brazilian songs in English and Swedish, and some originals, I think all songs are not decided yet. I've written many of the translations, and one original called 5 A.M. Her website was just updated with some new songs, one song featuring Magnus Lindgren on saxophone, and a great guitar-and-vocals version of Milton Nascimento's ENCONTROS E DESPEDIDAS, in my Swedish translation. 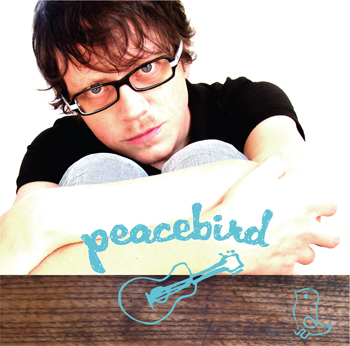 The release of my own album PEACEBIRD is delayed to September, but the pre-release Japan tour will start from July 23, and we will sell the CDs on the live gigs only, until the release. 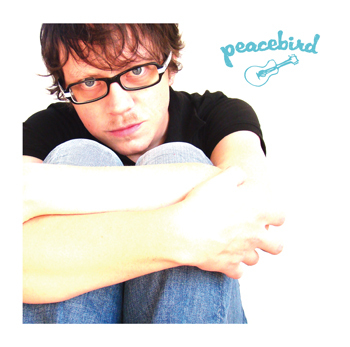 In a last minute revision, we may change the Peacebird cover design. Tweet me your opinion @jcschutz or send a direct message. We were really lucky with the weather, the audience could see the small harbour and a bit of the sea behind me. The clouds scattered during my performance and it was a really great afternoon. I had a great weekend in Kansai. Thank you everybody in Tokushima, Himeji and Kobe! 3 gigs in 3 days are very tiring. I just want to sleep for the rest of the week! Starting in Osaka on Thursday evening, meeting with painter Masako Kurokawa about the artwork for next year's Musical Album, having a drink and delicous food at PaPa Hemingway south of Osaka Station. I continued to Kobe where I spent the night in the Suma Beach area. I went out to the beach about 8 in the morning. It was very peaceful and lovely. Until horrible noisy yachts started cruising 50 meters away without reason. We arrived at noon, and Aoki was kind to take us for some sightseeing! Left to right: Tetsuya, me, Aoki and Fumiko. Tetsuya and Fumiko are the people behind the Scandinavian goods store and cafe Markka in Kobe (www.markka.jp). and took a ride in the 100-yen boat around the circle river. And finally, to the great cafe Yukinko. My live performance was sold out, and if I could understand japanese correctly, almost 50 people had to be refused tickets. Gomennasai!!! Next morning, wake up early for breakfast at a local cafe, and off to the bus stop. Back to Kobe for the evening's gig at Mother Moon Cafe Rokko. I was really tired, but could take a slow afternoon to relax before my gig. I had invited my friend Nao Tsuzuki to sing 3 songs with me as a special guest, and we performed the bossa nova songs Canto de Ossanha, Garota de Ipanema and This Sadness (from my album BLISSA NOVA). Next day was wake up early again (hayaoki), and go to Himeji and my favourite Hummock Cafe. It was the 9th anniversary party, and apart from my live performance Masao Maruyama and Hiroshi Yoshimoto played DJ before, between and after my 2 sets. Here's the handmade poster, painted on handmade blue japanese paper. Happy Anniversary Hummock Cafe! My voice was in great shape, maybe warmed-up after 2 gigs in the 2 days before, but 3 gigs in 3 days (each with 12-15 songs) are a bit too much. Anyway, I didn't have any problem with my voice which surprised me! The skies were cloudy, but when I started singing at 16:30 the clouds slowly disappeared, and the sun shone through. They call me Sunshine Man, because I often bring good weather, and yesterday was no exception. It's really a miracle. Here was the view I had from the "stage", the distant mountains to the right. The audience could see the harbour and the sea behind me, so Hummock really has a special location! Taken before my performance, the skies were still grey! Thank you everyone again for a great weekend. Even if each day was very intense, I could relax a little and rest my head from busy bustling Tokyo.